After nearly 17 years at Jones & Bartlett Learning and 45 years in college textbook publishing, Mike Brown has decided to retire. His leadership, insights, and relationships throughout his extraordinary career have helped make our Public Health and Health Administration titles some of the most respected and trusted resources in the field. "This is a comprehensive, well-written, and insightful book. The author has done an excellent job enhancing this edition and discussing current applications. All healthcare supervisors should use this book." "This is a very good book for interested students and college professors to begin digging into the world of healthcare ethics from the perspective of business and administration." Terrific news to share-- Organizational Behavior in Health Care, Third Edition by Nancy Borkowski, DBA, CPA, FACHE, FHFMA, recently earned 5 stars and a perfect score of 100 from Doody's Review Service. Excellent news to share-- Mastering Leadership: A Vital Resource for Health Care Organizations by Alan T. Belasen, Barry Eisenberg, and John W. Huppertz recently received a perfect score of 100 and 5 stars from Doody's Review Service. According to reviewer, Cynthia Lee Cummings, RN, MSN, EdD, from the University of North Florida Brooks College of Health, it "provides valuable information to those interested in healthcare leadership and management." Are you looking to engage students with the complexities of the U.S. health care system? We recently released Health Care USA: Understanding Its Organization and Delivery, Enhanced Eighth Edition by Harry A. Sultz, DDS, MPH, and Kristina M. Young, MS. Even better, each new print copy includes Navigate 2 Advantage Access that unlocks a comprehensive and interactive eBook, student practice activities and assessments, a full suite of instructor resources, and learning analytics reporting tools. Digital-only access is also sold separately. Review: The Effective Health Care Supervisor, Eighth Edition "is an excellent addition to any management library"
Great news to share-- The Effective Health Care Supervisor, Eighth Edition by Charles R. McConnell just earned a perfect score of 100 and 5 stars from Doody's Review Service. According to reviewer, Cynthia Lee Cummings, RN, MSN, EdD, from the University of North Florida Brooks College of Health, it is "an excellent book on management issues in healthcare." Great news! Health Care USA: Understanding Its Organization and Delivery, Eighth Edition by Harry A. Sultz and Kristina M. Young just received a perfect score of 100 and 5 stars from Doody's Review Service. Reviewer, James C. Townsend, DHSc., MBA, MIS, from A. T. Still University, writes that "given the changes in healthcare in the U.S. and the passage of the ACA, this book provides a much needed update." Do you know what to do when a fraud violation is suspected in a health care services environment? Would you like to learn more about both internal investigations and corrective actions when fraud may have been committed? 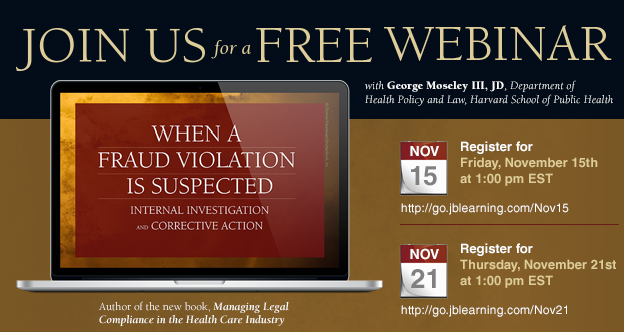 Join us on Friday, November 15 or Thursday, November 21 at 1pm EST for free webinars presented by George B. Moseley, III, JD, of the Harvard School of Public Health, and author of the recently published Managing Legal Compliance in the Health Care Industry.